Over the Samhain weekend at the end of October I participated in ‘The One Tree Gathering’ in Birmingham which brought together members of the Druid and Dharmic communities. I posted photos up on this blog here. And there is a full collection of photos from the event here. A participant made two very interesting posts on it here and here. In a third post on the Meadow, Stream & Grove blog there is fascinating discussion about the practice of washing stones with milk that is found in both India and in Celtic countries. You can find that here. Here is the text of the talk I gave at the beginning of the weekend, after we had held a Druid Samhain ceremony in the Balaji Temple community hall. In the ceremony we have all just participated in, we have revered our ancestors – for in the Druid year now is the time of Samhain, the time in which we think about our loved ones, teachers and guides, who have departed for the Otherworld. It is fitting that we have come together at this time, because our gathering is based upon the exciting idea that we share a common ancestry: that Druidry and Celtic and European cultures share a common origin with cultures which emerged in India thousands of years ago, and which gave birth to the ‘Dharmic religions’ of Hinduism, Jainism and Buddhism. The theory of the common origin of peoples and cultures as different as those found in India and western Europe first emerged in the 19th century when linguists noted striking similarities between certain languages – Sanskrit and Old Irish for example. Then other similarities were observed, leading scholars to suggest the idea that there was once – thousands of years ago – a culture with certain defining characteristics, such as the worship of a sky god, the use of the wheel and domesticated cattle, horses and dogs, oral heroic poetry and so on, which then spread out from its homeland to reach as far as the shores of Ireland and southern India. This idea helped to explain the mysterious similarities between religions and cultures separated by thousands of miles. In both the Celtic and Vedic traditions, for example, we find the ritual use of trees and sacred groves, water and fire for offerings, the washing of stones with milk, the doctrine of reincarnation, the reverence for triple deities, and it is no wonder that the Druids began to be seen as the Brahmins of the West by some scholars. Today there are many people who find spiritual inspiration in both Druidism and the Dharmic religions, and we can now see how those in this position may, in their own way, be attempting to reunite strands of a common cultural and spiritual heritage. The tree offers a wonderful image for us. It is one thing yet it is also a universe, a microcosm of all life, capable of fostering the lives of many creatures. Beneath it the great sages of India and the Druids have sought enlightenment, and at both ends of the Indo-European arc the sacred grove in the forest acts as a living temple for meditation, ritual and teaching. Some scholars believe they have discovered the original homeland of the Indo-Europeans. Like football team supporters we can feel a wave of either excitement or disappointment as the arguments are presented: the point of origin, the source-land was the Indus Valley according to the Out of India Hypothesis. A cheer rises up from those who are thrilled by this idea. But no! The source was Anatolia or the Armenian Highland say other theories. Another cheer goes up. Most scholars, though, are agnostic – admitting that we simply can’t be sure. Rather than being upset, I suggest that we rejoice in this lack of certainty. If we become attached to any one theory, there is always the risk of chauvinism. Regrettably this has already occurred. 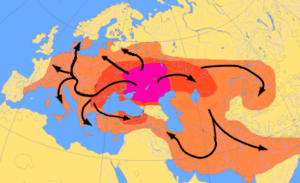 The idea of a Proto-Indo-European culture was hijacked by the Nazis in their attempt to promote a ‘Master-race’. Now is not the time to explore this issue, but it would be remiss of me not to mention the way in which the idea has been misused, and how it can easily become politicised. A lack of certainty forces the intellect into a position of humility. The reality is that, like a tree, our origins are hidden in the darkness of the soil, away from the prying eyes of the analytical mind. In this weekend together we can let go of any concern about which theory, if any, is historically correct. In the deepest sense of course we all have a common origin: we are all one People on this one Earth and are all children of Deity. In addition we can say that there are these resonances, these uncanny similarities, between our traditions, which – if we explore them – can enrich our faith and our experience. So, with open minds and hearts let us see where our ideas and practices merge, and where they separate, where they are different – for the goal of our gathering is not to foster sameness but to encourage unity in diversity. In this spirit I shall talk a little about the Druid tradition so that those of you who are unfamiliar with it can get a quick overview of the subject, and then during the course of the weekend I hope we can all learn from each other and from the traditions that are less familiar to us. The way things have worked out, in this weekend the Dharmic traditions of India are mainly represented by members of the Hindu community, in future meetings we hope we can include more representatives from the Buddhist and Jain communities also. Nevertheless we will be showing a film this afternoon made by the Jain teacher Satish Kumar, and amongst us there are indeed some Buddhists and Jains. On the bookstall there are copies of an excellent book that explores Celtic and Druid Spirituality with the help of a Buddhist perspective – Jason Kirkey’s The Salmon in the Spring, and copies of a paper I wrote on the resonances between Jainism and Druidism. One of the striking characteristics of India, and of Hinduism in particular, is the way differences are embraced. ‘Unity in Diversity’ is a motto often heard there, where there really is a sense that one is free to embrace, explore, and express different approaches to the Divine in an atmosphere of generous inclusion. As a Professor of Religious Studies whom I met in Nagpur said: “Just as the old saying ‘all roads lead to Rome’, similarly the Indian view of life is not very much concerned as to the path you follow, as long as the path takes you to your desired goal: ‘Anandam’ happiness or bliss…We are all children of Mother Earth ‘Prithvi’. We are all ‘Earth Pilgrims’ as Satish Kumar would say. I am the taste in the waters, O Son of Kunti. I am the syllable Aum in all the Vedas. I am the sound in ether and manhood in men. I am the pure fragrance in earth and brightness in fire. I am the life in all existences and the austerity in ascetics. Know Me, O Partha, to be the eternal seed of all existences. I am the intelligence of the intelligent. I am the splendour of the splendid. I am the strength of the strong, devoid of desire and passion. In beings I am the desire which is not contrary to dharma, O Lord of the Bharatas. know they are all from Me alone. I am not in them, they are in Me. K: I am the taste in the waters, O Son of Kunti. K: I am the syllable Aum in all the Vedas. K: I am the sound in ether and manhood in men. K: I am the pure fragrance in earth and brightness in fire. K: I am the life in all existences and the austerity in ascetics. K: Know Me, O Partha, to be the eternal seed of all existences. I am the intelligence of the intelligent. K: I am the splendour of the splendid. K: I am the strength of the strong, devoid of desire and passion. K: In beings I am the desire which is not contrary to dharma, O Lord of the Bharatas. And whatever states of being there may be, be they harmonious, passionate, slothful – know they are all from Me alone.